This fall, a new primetime drama appeared on the television network WGN America, featuring scientists at Los Alamos working tirelessly--desperately, even--to develop nuclear weapons during World War II, all while maintaining utmost secrecy. Manhattan draws on the rich underlying history of its namesake, the Manhattan Project, but steers clear of documentary tendencies. Whereas the premise of the show and several key figures are largely based on their real-life counterparts, the main cast is populated by fictional characters, whose personal and scientific struggles acquaint us with the broader themes of privacy, government surveillance, and trust. Today on the podcast, we discuss how Manhattan brings nuclear physics to primetime TV, and what’s gained or lost along the way. 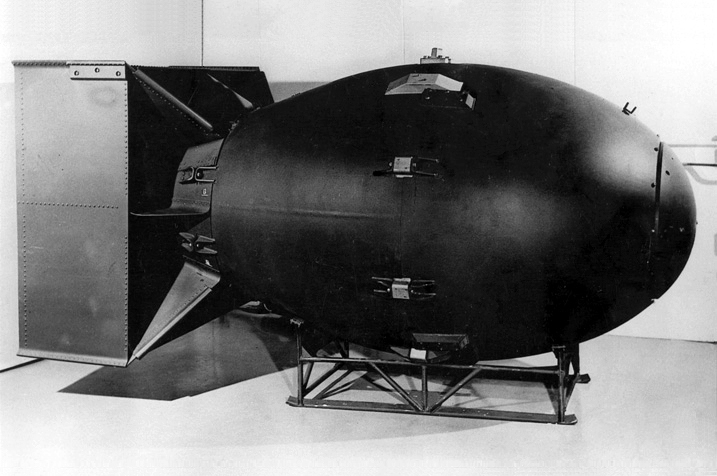 A replica of the Fat Man bomb detonated over Nagasaki during WWII. Jennifer Ouellette, science writer and former director of the Science and Entertainment Exchange, is impressed with Manhattan’s creative and dramatic storyline, and notes that the on-screen science, vetted by several technical consultants, is not only presented accurately, but also motivates much of the narrative and character development. While she acknowledges that the central conflict of the first season--a rivalry between two different designs for the atomic bomb--was magnified for dramatic purposes, Ouellette maintains that it makes for “more powerful storytelling, and there’s always going to be that tradeoff.” In reality, both bomb designs, the gun-type Thin Man and the implosion model, were developed into working weapons, and one of each type, Little Boy and Fat Man, were dropped on Japan in 1945. Although she recognizes that Manhattan portrays a fictional version of events, Executive Director of the Los Alamos Historical Society Heather McClenahan isn’t happy with all aspects of the dramatization. For one thing, the series was filmed in a dry, dusty region south of Santa Fe, whereas Oppenheimer specifically chose a mountainous location for its inspirational views. The depiction of the Manhattan Project director himself has been another disappointment. The Oppenheimer of Manhattan is cold and detached, unlike the competent, hands-on leader beloved by the Los Alamos community. Despite these meanders from historical accuracy, Manhattan has been good for business, sparking a wave of curiosity in the real Manhattan Project and boosting Los Alamos tourism almost immediately. It also showcases the human aspects of science as a process, and Ouellette is impressed with the show’s diverse cast of complex characters. Manhattan’s producers do their best to balance science, history, and storytelling. Do they succeed? With a second season in the works, the outlook is good so far, but we’ll have to wait and see what happens next. You can catch up with all of Jennifer Ouellette’s episode recaps on her blog, Cocktail Party Physics, and check out her Q&A with Manhattan creator Sam Shaw and executive producer Dusty Thomason. The Los Alamos Historical Society’s weekly discussion groups based on each episode are summarized on the society’s blog. Here are two highly recommended books from the Los Alamos Historical Society: Standing by and Making Do: Women of Wartime Los Alamos, and Inside Box 1663. To learn more about the Manhattan Project and nuclear weapons development, check out Alex Wellerstein’s comprehensive blog, Nuclear Secrecy. -Podcast and post by Meg Rosenburg. "early in the morning of Aug 6 1945 dad wad called to the flight deck to give communion to the crew of a 'special mission' he later found out was the Enola Gay"-our family wishes to share the communion set with the world as a symbol that "we trust that even in the tragedy of war there is hope and faith and forgiveness and sometimes peace"
cheap sighed still did not speak. I came barbour sale outlet barbour sale outlet jiangzhou, barbour sale outlet And just two barbour factory shop letters are from jiangzhou, so I excuse to travel, from Yanjing barbour sale outlet came jiangzhou. Sorrow worse, found the two women wrote to me, a contact at barbour outlet sale the same time we know that Zhao Bin in contact with many people. Make sure you equally look at blackout lining for the unit and additionally color choice arrangement utilised by Louis Vuitton just for output the required handbags. cartier replica Louis Vuitton could be very targeted approximately buying color choice permutations for those home elevators color choice and also purses you can view inside the websites. hublot replica Privided you can verify a good color choice from the targeted formula, then you may well grow or possibly a unit is normally faux or possibly substantial. fake rolex All of these monograms can be usual and additionally Louis Vuitton beautiful purses enjoy a basic monogram and additionally Louis Vuitton could be very conscientious approximately positioning all the monogram to hand bags. replica hublot All the monogram can provide an outline concerning the fakeness about ladies handbag the expense of not likely used suitably. replica chanel All the monogram delivered throughout the the purse is typically symmetric for color choice using good condition. There are many versions about the development of the Manhattan Project. Search sources is one of the most difficult tasks when writing essays. many people use to essay writing service on grabmyessays.com. Manhattan Project has already caused so many discussions and theories. I've heard about it from at least a dozen of my colleagues at the university. My friend from assignmentjedii.co.uk - professional assignment help even writes a huge research work on it. Keep up for the good work michaelkorsoutletq! The information which you people are given are really superb mircenbiotech..!!! For my view is Really nice. The nuclear physics include theoretical work, experimental examination of nuclear particles, and designing equipment. An essay writing service will help you to complete your future writings. Good stuff comments here... Nice to read it.